October, in addition to being one of the best time for visiting Iran due to pleasant weather; now in 2016 the coincidence of October and Muharram will be a great chance to experience the month of sorrow, resistance and love in Iran. Muharram is the first month of lunar calendar when my people try to show their love and respect for Imam Hussein -the grandson of Prophet Muhammad- in lots of traditional rituals during the first ten days of this month. The tenth day of Muharram, known as the Day of Ashura, is the most important day of the Mourning as it’s the day of Imam’s martyrdom. Behind these rituals you can hear the shout of freedom through the history with the massage of awakening for all human beings. The Iranians hospitality and generosity this time are presented in free meals called “Nazri” for everyone in the town especially poor people. Although these rites take place in numerous parts of Iran and you can visit the gangs of mourners in every street, in some cities including Yazd, Kashan, Shiraz, Tehran and Isfahan, they are held much more glorious with more Iranian local foods as Nazri. 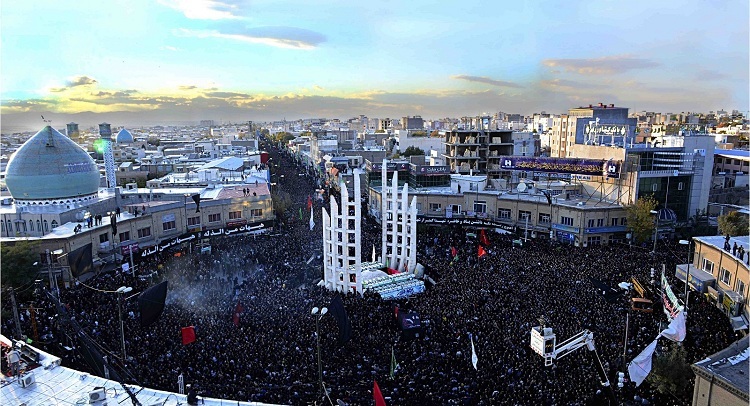 There are various traditions such as Taazieh, a kind of street theater in costume inspired by historical and religious events which happened in Karbala battle about 1400 years ago and Nakhl Gardani, carrying a majestic wooden Nakhl – a symbol of Imam Hussein’s coffin- on the shoulders of mourners. Wanna learn more?